Recently I’ve moved. It was stressful (and I only moved a block away! ), but it was also a good time to purge and re-assess my possessions. We moved into an entirely new space, from a traditional house to a modern townhouse, so not only did I purge unnecessary possessions, I also used it as an opportunity to re-decorate. But this time I was going to fill my new home with only items that I loved and decorate with personality. Larger furniture pieces like a sofa and table are best bought as investments so I have a gray sofa and a wood table, but I expressed my decorating personality with accessories and really had fun. Do you know your decorating personality? A good clue is to look at your fashion style. Is it a boho Free People style or are a wanna be rocker with leather jackets and black ripped jeans? Maybe your fashion style is more uptown, classic and understated than downtown cool. Is your fashion mantra less is more or more is more? You can also use your dream location as a clue. Where do you most feel at home? Is it on a horse farm, in a laid-back beach community or in a big city? Peace signs are one of my favorite icons so that showcases my personality, but really these Jonathan Adler pottery pieces just make me happy. Notice the different mouths on either side of the vase? My style is also eclectic; I like Mid-Century Modern, but something vintage is also great. Vintage finds add personality and originality. I doubt that many people have this lion head or these monkey bookends that I found at an antique market. Lions are my favorite animal and the monkey bookends are cheeky. Surprises are fun. I saw this giant fork in a design store and just had to have it. It’s rustic, so in a more traditional setting like farmhouse or country decor it might not stand out as much, but in my modern home it does. It’s also placed on a small sliver of a wall space, so that intensifies the size. I bought this peace sign wreath as a Christmas decoration and liked it much that it became a permanent fixture. Again it plays with that tension between what you expect – rustic, because it’s made of twigs – and surprise because it’s in a modern home and it’s very very big. It’s at the top of the entry staircase, so it’s the first thing you see as you enter the main level. And remember that I love peace signs! Yard sales and vintages stores can be gold mines. You don’t need to buy new items to decorate with personality. Take a look in your closets, in your basement or attic or maybe your parent’s house. What do you love? What brings your joy? 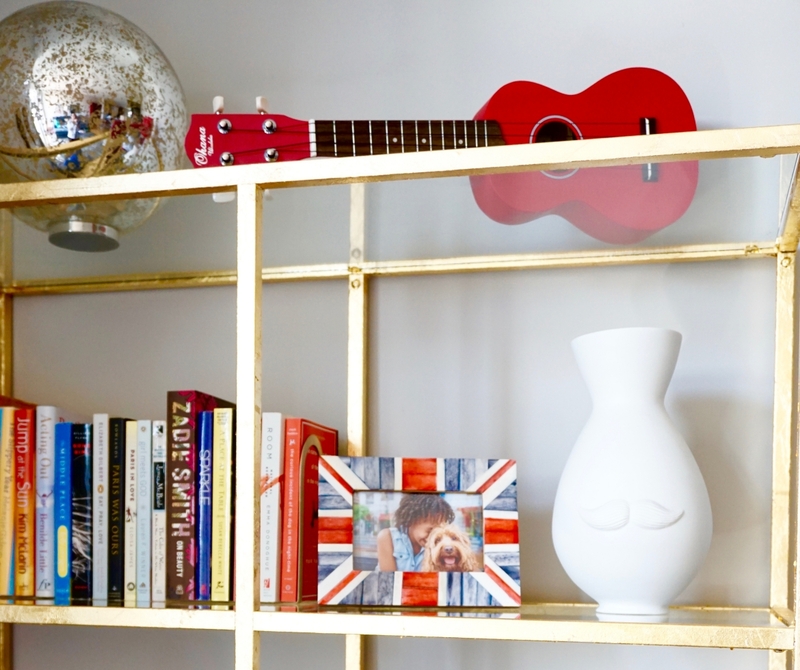 Can you incorporate that item on a bookshelf or coffee table? Can you hang it on the wall? On a warm weekend afternoon cruise the neighborhood yard sales. That $5 Mid-Century Modern ash-tray may be the perfect catch-all for keys in your entry-way. That quirky flamingo vase may be just the right piece to add some much-needed personality to a quiet living room corner. What about that pretty jewelry box that you bought on vacation but doesn’t fit on your nightstand anymore – it might make a great place to stash all the tv remotes (my tv has 3 remotes and it’s annoying and messy). The only rule is that it whatever you display shows your personality and makes you happy. I love the decorations in my new home, they are authentically me and bring me joy. 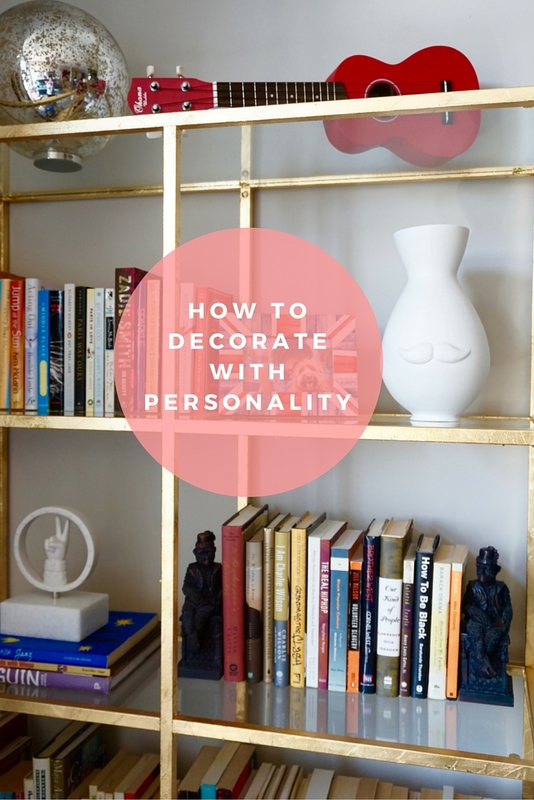 If you don’t know your decorating personality these quizzes by Houzz, Stylecaster and Play Buzz are fun and might give you some insight to figure out your style. For even more inspiration check out my Pinterest page. If you have any questions I would be happy to answer them here in the comments or on Facebook. But really just have fun and be you! I’m getting in touch with my interior decorating abilities. Just recently, I designed a game room for my children. It was their Christmas present. I had such a great time searching stores for decor. I’m proud of the finished project and the kids love it! I think our home office will be my next design project. Krystal that was so sweet of you to design a game room for your kids. Now you deserve an inspired place to write your books!